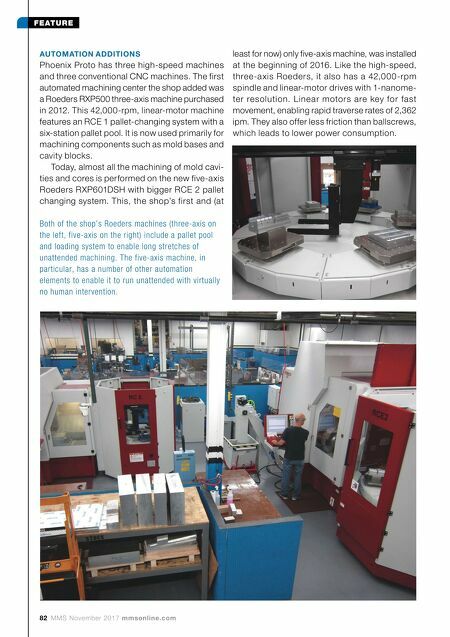 mmsonline.com November 2017 MMS 83 FEATURE The five-a xis machine with 21.3- by 25- by 15.7-inch machining envelope and ma ximum wor k pie ce we ight of 440 pounds fe ature s a trunnion-style design with A-axis swivel ranging to ±115 de gre e s. T he othe r rota r y motion is provided by the C-axis platter on the trunnion. According to Matt Byers, president of Roeders of America, the trunnion design in which the spindle provides no rotational a xis movement tends to be more rigid than alternate five-axis machine platforms to enable heavy cuts. In addi- tion, the low center of gravity for the workpiece keeps inertial forces low to mitigate any tipping or tilting effects during high-speed motion. M r. B y e r s a l s o b e l i e v e s t h e m a c h i n e 's proprietary control technology offers advantages for the type of high-speed milling Phoenix Proto performs. Two important parameters to facilitate effective high-speed milling are lookahead and block processing speed. 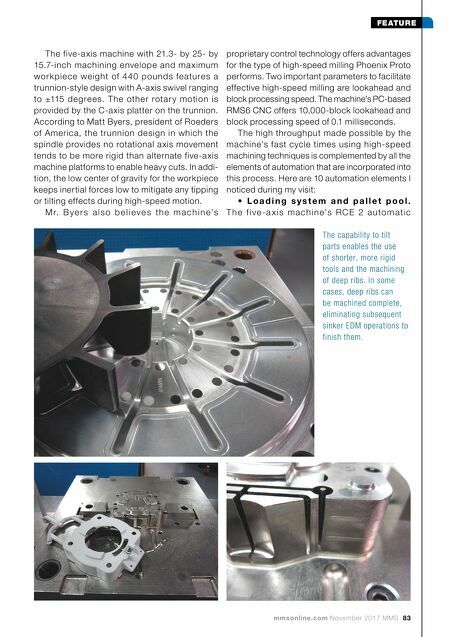 The machine's PC-based RMS6 CNC offers 10,000-block lookahead and block processing speed of 0.1 milliseconds. The high throughput made possible by the machine's fast cycle times using high-speed machining techniques is complemented by all the elements of automation that are incorporated into this process. Here are 10 automation elements I noticed during my visit: • L o a d i n g s y s t e m a n d p a l l e t p o o l . T h e f i v e - a x i s m a c h i n e's R C E 2 a u to m a t i c The capability to tilt parts enables the use of shorter, more rigid tools and the machining of deep ribs. In some cases, deep ribs can be machined complete, eliminating subsequent sinker EDM operations to finish them.